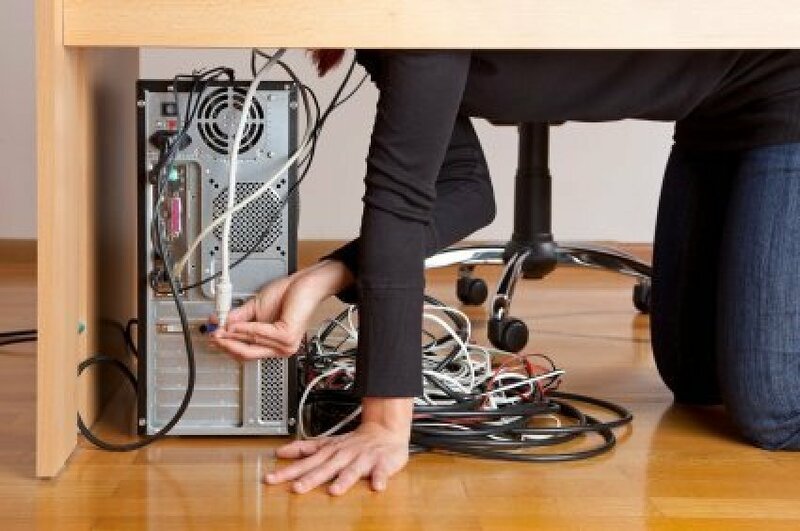 Computer cords, cables or wires can become an unsightly mess behind you computer desk. Organizing the wires and keeping them from getting tangled can make it easy to swap in new components. This is a guide about organizing computer wires. When you unplug your computer as you are revamping a room, or planning to use it in another room, here is a solution to tearing down and setting it back up. I worked for computer companies and troubleshooting for the customers. Some were not as knowledgeable as others and so they would unplug everything and not know where the cables would go. My solution is to take cheap nail polish and before unplugging the wires color coat the cable and above the plug-in in back of computer with the same color. On the next cable use a different color. This also is good for reminding you what end goes to computer and the one that goes to printer or fax machine by color coding. Also, if you live in your own home, use this on the plug that the phone system and computer share or fax. You will not have any more problems hooking your own computer up. I have helped several people, including workplaces, with this technique and they loved it! I am by no means electronically gifted. And any time I have to unplug my computer, then plug it all back in again, I used to invariably have to holler for help! I finally came up with a simple solution. I turned the tower around so I could get to the back easily. Then I took small pieces of paper and printed bold numbers on each one: 1, 2, 3, etc. I covered each paper with tape (front and back) and then taped a number to each cord close to where it plugs in at. Then on the tower itself, I took a medium-fine permanent magic marker and marked the corresponding number next to where each cord is plugged in. Now if I replace a piece of equipment (get a new printer for instance) if I can't use the same cord, then I simply mark the new cord in the same way with the same number and plug it into the same place. If I get something new, I mark it the same way. Or when I get the computer back from being repaired (believe me I threaten the repair shop with their LIVES if they remove my markings! ), it only takes me a couple of minutes to hook everything back up! This method has saved me many hours of frustration, tears, and words that the fella down below would blush at! I always had cable cords draped over a door knob by my computer (closet). It looked unsightly so I put a hook, large enough to hold my 4 cords, in the closet which houses my computer/desk. You can also put 1 on the side of your tower or desk by attaching a self stick hook or a Command hook which requires no holes if you don't want to put anything on your wall. Less clutter - less stress. I take single labels and fold them in half over the cord close to the end that goes into my device and label it. Question: How can I organize my computer wires? How can I organize my computer wires? I COMPLETELY reinforce the pipe cleaners, since that is what we use. A couple other ideas - go buy the little hooks for attaching christmas lights up (usually sticky on one side - clear or white) for getting any wires off the floor that lead along the floor - they're practically unnoticable attached to your trim and then you can vacuum without cords in the way. A very helpful thing is to write each item on a post-it and tape it to each cable (monitor power, CPU power, speakers) so when you need to move or unplug something, you not only know which wire to grab without tracing them ALL (and there are many) back to the source, but if you move things around, putting things back together is so much easier. place them together and fasten them with a bread or baggie tie. I love the hook idea! I'm buying some of those. For identification, as soon as we purchase a new item that has a cord (printer, phone charger, etc.) I take a sticky label, write the item's name on it, and fold it onto the end of the cord near the plug. That way, you can look at the electrical strip and tell what the cord goes to. I also label the electrical strip plugs: "Printer", "Monitor", "Phone", etc. I use twisties or strong rubber bands to hold the excess cord. I found a pretty good article on how to organize wires with using a combination of carabiners velcro straps and twisty ties. The nice thing about using carabiners and velcro straps is that they are easy to remove if your like me and constantly adding and removing wires. 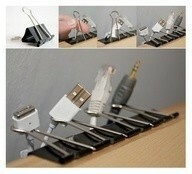 I LOVE the phone cord idea! What a wonderful idea! I use the Velcro reusable ties for everything! For stuff that goes to the camera that I don't use often but need to know where they are. Hubby has a book case that I took over stocked flat box from post office (even a shoe box will work) and I used the lid to create 4 separate sections. Each section I put one cord; one for charger, one for usb and one for the actual camera, then one for the software. Then I slide it on a shelf with the box labeled on what it is. Works great for us. How do I hide black computer cords on a white desktop? I have them plugged in underneath the desk and hidden, but there are still lots of cords on the desk top plugged into my laptop that look messy. Any suggestions? Has anyone got an idea or solution for hiding wires from the computer, printer, phone, lamp, etc. at the computer desk? Like everyone above thirty I have aches and pains. Mine aren't common; I can barely get around after a bout of meningitis. My computer went down, and my friend came over (he's a computer engineer) and fixed it. When the time came to put it back and boot it up, I took masking tape and marked each cord that went into the tower. Now if I have to move the tower (or clean it), I can easily tell what cord goes where. Computer buffs know what goes where, and so they don't have to think about it. But in tight quarters, it is so easy to re-connect or troubleshoot about what cord may be loose. It worked for this dummy! We just got a new computer desk and I have a terrible mess of computer cords from the existing computer. It looks like an out of control octopus. Does anyone have a simple way of getting the cables and cords behind the desk? I am worried about unplugging everything and then the computer not working again. I am a computer beginner. Thanks for any help or suggestions. Thanks for the replies so far, but I need to clarify my question. Is there any way that anyone knows of to simplify unplugging and re-plugging in all the cords? The new computer desk is the tall kind with holes in the back wall for the cords. There is a slide out keyboard tray as well. Right now there is a giant mess of cords to the side of the desk and I need to feed those cords through the back and then I will be able to tie them back as you all have suggested. I just am not sure of how to go about setting it all up again and I am worried that it won't work right once I unplug everything. I was looking for some way of identifying the components and cords so I wouldn't get mixed up when it is all apart. There are so many smart people on this site that I thought someone might have a clever way of doing this. I think I know what you are getting at, and I don't think there is really any "simple" way of doing what you're wanting to do, other than maybe labeling them somehow as you unplug them. But, usually, computer cords all only plug into one place, so there really shouldn't be a problem of getting them mixed up. Hope that helps. When I first started using the computer I had the same concerns you do and was very worried I would hook it up wrong if I unplugged it. So I did this. I got some masking tape and on each cord I put a letter starting with A. I then went to where that particular cord was plugged in on the back of the tower or component and put the corresponding letter where the cord plugged into. In other words...A to A...B to B etc. worked great and got it right every time. Just be sure you get the tape on so it doesn't fall off before you get it back to the right place. I know that Radio Shack sells label for this exact thing or they did, but tape works just fine. Masking tape is easy to remove also if and does no damage to the cords or the computer. Hope this helps. Hi, I was very computer illiterate a few years ago. I'm still not great but you can look at the ends of the cords and then at the plugs on the computer and see where it goes. They are shaped differently and some are also labeled. You can do it! Just do this when you have a while and aren't rushed.